A new Philadelphia law would prevent reverse mortgage servicers from foreclosing on homeowners who have entered into property tax payment plans with the city — but several players in the industry say it’s not that simple. Introduced last week by city councilwoman Cherelle Parker, the law specifically attempts to stop mortgage servicing companies from paying off borrowers’ back taxes in order to commence foreclosure proceedings. In a statement, Parker described this practice as “quite common,” and pointed to an update to the city’s Department of Revenue that also attempted to stop the practice. “It is my hope that these new regulations and my accompanying legislation will protect homeowners by finally putting an end to some of the more unscrupulous practices we have seen from reverse mortgage lenders,” Parker said. But the Department of Housing and Urban Development has its own set of rules regarding unpaid property taxes and foreclosures, and servicers often don’t have a choice in the matter. Unless the taxing authority completely forgives the tax bill or the taxes are subordinate to the first-lien position on the property, Flynne said, the borrower isn’t meeting the requirements of the Home Equity Conversion Mortgage loan. HUD rules require mortgagees to ensure that any tax-deferral programs don’t jeopardize the department’s lien position and also don’t leave HUD on the hook for any back-tax payments upon the borrower’s death. “This is a dilemma that HUD has created with their position on tax-[deferral] programs,” Flynne said. When asked for an example of a scenario Parker hoped to prevent with her proposed law, her chief of staff, Rachel Meadows, forwarded along the story of Philadelphia widower Leonard Hitch. Hitch’s wife handled the couple’s finances, and when she died, he fell two years behind on his property taxes, according to Meadows and information from Community Legal Services (CLS) of Philadelphia. To remedy the situation, he entered into a low-income tax payment plan with the city, which allowed him to pay $54 per month. After just two payments, Champion Mortgage paid the balance of his property taxes and moved to foreclose. With the help of CLS, a local non-profit, Hitch was able to receive a grant from the city’s Housing Retention Program to repay Champion for the $3,600 in tax expenses — and stay in his home. The spokesperson also noted that Champion must follow HUD’s “extremely prescriptive” servicing guidelines, which require servicers to initiate foreclosure proceedings as long as local government records show a homeowner in tax default — even if he or she had entered into a payment plan. 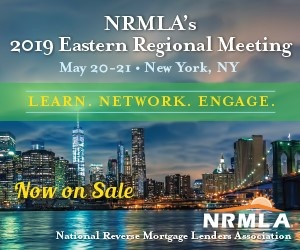 The National Reverse Mortgage Lenders Association has weighed in on the controversy, with executive vice president Steve Irwin warning that the proposed Philadelphia law could dupe homeowners into a false sense of security: Borrowers in trouble might incorrectly assume that the city law preempts the Federal Housing Administration and HUD servicing guidelines that servicers must follow. “As currently drafted, we are concerned that Philadelphia Bill No. 180138 will inadvertently place Philadelphia seniors with current FHA-insured HECM loans or other reverse mortgages at greater risk while not affording them the benefits we believe you intend,” Irwin wrote in a letter to Parker.